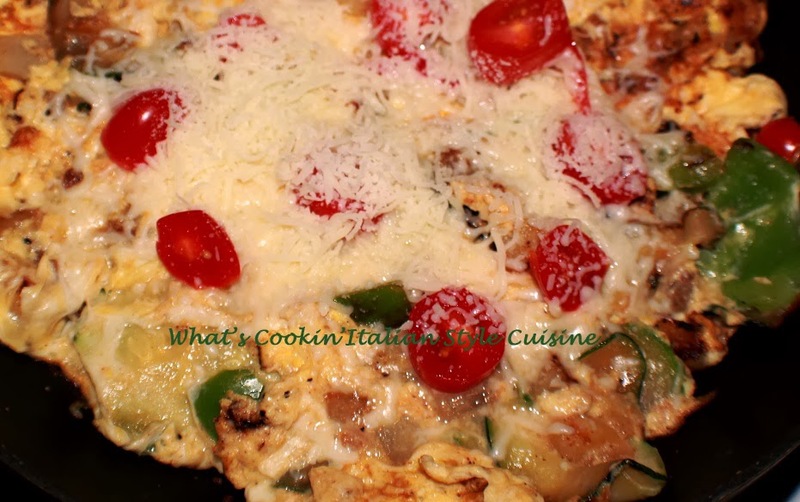 A frittata is a mixture of egg and any ingredients you love! I have made several over the years. This one has shaved zucchini slices, hot sliced peppers, precooked cubed potatoes, grape tomatoes, mushrooms, garlic and lots of love! I made this for a Sunday breakfast with my boys when they visted, there is something about breakfast that bonds the family over the years with sweet memories and this is one of them. You can make your own memories with whatever ingredients you like and here's how! You will always get, no one makes it quite like mom did! 4 eggs beaten with 2 tablespoons of water per person if you have hearty eaters in your family! Cappicola, ham, prosciutto, pepperoni, salami, cooked crispy bacon, cooked sausage, thinly sliced beef, cooked escarole, chopped peppers, cubed potatoes I precook them by boiling till soft , spinach, thinly sliced zucchini, mushrooms, eggplant sliced thin, minced onion, minced garlic, sliced tomatoes, hot peppers sliced, cherry peppers sliced, kale, cubed sweet potatoes precooked, mortadella, seafood of any kind like scallops, shrimp, lobster, crab. Use the many cheeses such as shredded provolone, mozzarella, fontina, grated cheese or the many other cheese of choice. In a large skillet, add 3 tablespoons of olive oil and heat on medium heat. Saute garlic 1 minute then add the eggs and whatever the suggestions above your family likes. Cook on one side around 3 to 4 minutes until light brown or longer till set tilting the pan back and forth to move the loose egg around. Flip over using a large spatula. Place the shredded cheeses of choice on top and fold in half. Flip onto a plate. Serve with Italian buttered toast.